The spring Blogger’s Quilt Festival voting is happening this week over at Amy’s Creative Side! 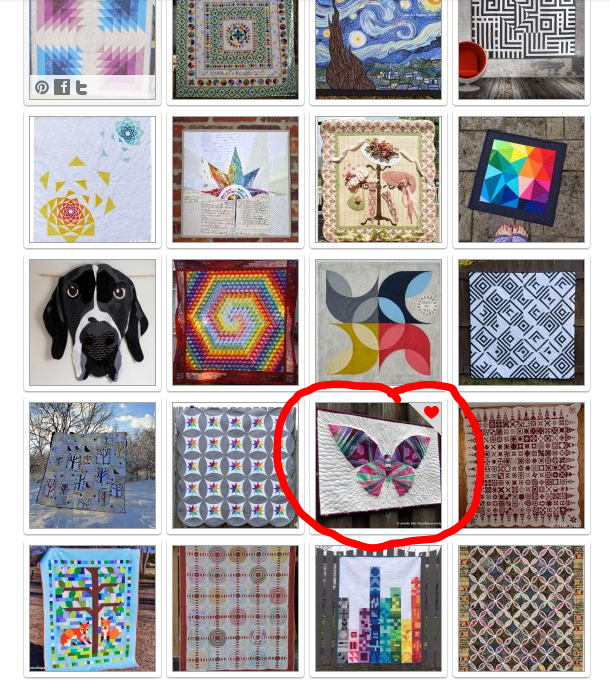 I’m happy to announce that my mini butterfly quilt made it into the Viewer’s Choice category as a finalist. If you have the chance, hop over to the site and check out all the quilts in many different categories. You can vote for up to 3 quilts in each category. Each photo takes you to the quilt maker’s blog so you can read about individual quilt details. If you’re inclined, I’d love your vote!! This entry was posted in Events, Mini quilts, Modern, Quilts and tagged Blogger's Quilt Festival, Butterfly quilt, Cotton & Steel, Viewer's Choice by thequiltedcat. Bookmark the permalink. You got my vote, Jennifer! YAY!!! I voted for ya!! !